VATICAN CITY (CNS) -- The idea of exceptionally ordaining older married men of proven virtue to celebrate the Eucharist in isolated Catholic communities is something that should be discussed, said Cardinal Beniamino Stella, prefect of the Congregation for Clergy. "It is not about being in favor of or against something, but about attentively evaluating various possibilities without being closed or rigid," the cardinal said in a new book in Italian, "Tutti gli Uomini di Francesco" ("All Francis' Men") released Jan. 22 by Edizioni San Paolo. Pope Francis was asked by the German newspaper Die Zeit last year about whether, in the Latin-rite church, he could see allowing married "viri probati" -- men of proven virtue -- to become priests. "We have to study whether 'viri probati' are a possibility. We then also need to determine which tasks they could take on, such as in remote communities, for example," Pope Francis said. The issue is expected to come up in the 2019 special gathering of the Synod of Bishops to study questions related to the church's pastoral work in the Amazon. Already at synods in 1990 on the priesthood and 2005 on the Eucharist some bishops -- especially from Brazil's Amazon region -- suggested ordaining married men as the only way to ensure Catholics in isolated villages could receive the Eucharist regularly. The issue is expected to come up in the 2019 special gathering of the Synod of Bishops to study questions related to the church's pastoral work in the Amazon. Cardinal Stella said that in the Amazon or in some remote Pacific islands, "but not only, there is acute suffering because of a real 'sacramental emergency,' which the few priests present are not able to accommodate." The discussion Pope Francis wants the church to have, he said, is to look seriously at all the options for responding to people's real hunger for the Eucharist and honoring its central place in the life of the church. 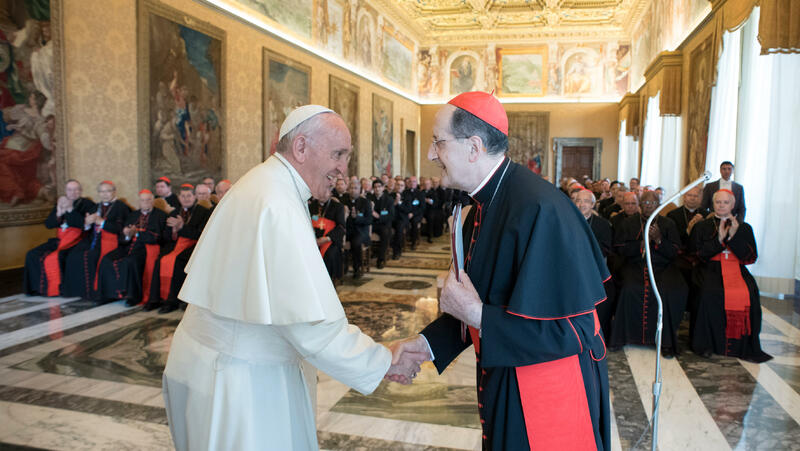 While the Catholic Church throughout the world, especially in the more secularized West, must improve its vocations work, Cardinal Stella said, it also should study the possibilities and see if "the Spirit suggests something." One possibility to explore is the exceptional ordination of older married men in remote communities, he said. "Continuing to maintain their family and jobs and receiving a formation contextualized for their environment, they could offer part-time service to the community they come from in order to guarantee the sacraments, especially by presiding at the eucharistic celebration." But an "attentive study and a widespread ecclesial discernment" are necessary before moving in that direction, he said, adding that the ordination of elders in those cases would never mean changing the usual requirements for and ministry of priests in the Latin rite and "in no way would lead to optional celibacy." Bull! This would be the start of sneaking in Gender Segregation thru trickling in only married men into priesthood. Every Catholic should protest this idea vehemently if they have any love for their sisters in Christ. Many women have been called to priesthood in our church and it is a huge further attack against the human dignity of these women and all women in our church if we see this happen anywhere and do not protest it publicly at ordinations and churches where ever we live. There has never been this brutal an attack supported against the women of our church. Even when priests married in the early church there existed women presbyters so these women were equally priests to the men. By the time no more women presbyters were being allowed neither were married priests being allowed. This change allows all men to have all sacramental and governmental church authority over all women while continuing the hateful misogyny against the women in our church by not allowing them equal and same priestly ordination and above. This makes women voiceless compared to all men in matters of religion including even married men who represent the majority of men in our church. Shame on us if we do not fight this with all our strength! If this cardinal needs more priests then he and his brother cardinals need to repent of their hatred and distrust of their sisters and ordain the women who have been called to priesthood first. These women have been abused and their humanity attacked. What reason other than pure hatred do we have to even suggest ordaining married men while we are not ordaining women to priesthood? Keeping women from ordination due to gender is a human justice issue. Allowing married men to be ordained is not. Fix what is so horribly broken before giving more and more benefits to more and more men. Already we are losing women at a faster rate than men. Apparently, this cardinal thinks this church can do just fine without any women at all. Celibacy is beneficial to all priests. Many live lives of, frankly, bitterness caused by loneliness. Well, most of our cities and towns are well on the way to being "isolated villages" without priests. I do hope a few thousand viri probati can be found. They are certainly neeeded. catholics are so afraid of a priesthood of wholly committed faith filled women who truly love our church and truly only want it to thrive and be alive for our children. what is really so frightening for women to have a voice and to be a truly active participant as well as a leader in our church? Truly, WWJD??!! St. Peter was married and Jesus chose him as the first one to head the church. I don't see why we cannot have married priests. It only makes sense. Because to do this before we have women priests puts all men in authority over all women and further attacks the human dignity of all women. It truly saddens me to see women support this horrible suggestion. It is fine to have married priest after or at the same time we are ordaining women priests but it is a grave sin to further, in a very extreme way, the already present misogyny in our church rules. If this would be a first step towards the Church coming at last to grips with its historic and unreasoning fear of women, I'm all for it. But it would be only a first step, and a rather minor one at that. Hi Nicholas - Gender segregation is not a help to women, it is an abuse against our gender. If we need priests, the non-sexist action would be to ordain women priests not place all men over all women as sacramental lords in our church. This change would be a greater abuse to women not a lesser one and alleviating the priest shortage with married men to whom no injustice was done, will only result in making women wait longer for justice. Please do not support this change but oppose it. Frankly, I think ordaining more married men is not the way to go. We need women priests. I hope there will be celibate female priests before more married male priests. Celibacy for the sake of the kingdom is a sign that we need in today's world. Why should we have more married male priests when there are so many celibate women who would be wonderful priests? The Catholic Church should recognize that religious patriarchy is cultural rather than dogmatic and start ordaining women to the sacramental priesthood. More men will go to church when we have women priests. The elephant in the room here is that there are already ORDAINED female priests. I have known about this since the 1970's, and they have only recently (since 2002) made themselves public. I am tired of being part of a misogynistic religion that is not fully inclusive of women in its day to day spiritual life. I won't actually leave the faith I have loved over the years, but I don't particularly like that most of the leadership positions, including ordained positions, in the Archdiocese where I live (that have power, not simply the social service aspect) are men. Thank goodness for the brave women that are being ordained (legitimately) and are willing to go public with their ordination and celebrate Mass in a public way, albeit not in their beloved Catholic Church and without Archdiocesan sanction. Thanks, Nora Bolcon for your posts. Would love to talk with you! Men, you just don't get it, nor do you "get" the female position on this important subject. Hi Peggy, I thank you for your comment! I would love to talk with you as well. I have been trying to work on starting a grassroots type of monthly meetings arena, that could start by meeting online, like once a month, and hope to quickly trickle down into groups who meet in person in every state. This lack of gatherings, in person, and with continuous dialogue between people truly interested in demanding a just church for all is what has kept WOC weaker than it would have been, I think - they have no real large amount of feet on the ground that are well organized. However, I have found in the New England area, especially, since the women's march, many women and men, who are Catholic, and very angry at how we keep seeing churches close yet won't even consider women priests. I have heard of Roman Catholic Women Priests and yes I agree that they were legitimately ordained since they were ordained by legitimate Catholic Bishops in communion with the Roman Catholic Church at the time of their ordinations. I have many ideas and would love to talk with you about yours. Hopefully, this website will allow me to put this email address down for you to send me an email - I started trying to put together a new website about a year ago, to begin a group whose only goal is same same sacraments and ordination and treatment for all Catholics called to ministry, in our Church, starting with women and ordained priesthood. RESTORNOW - which stands for Realizing Equal Sacredness, Treatment and Ordination in Religion NOW is the website but it is not fully up yet since I had family and work issues which pulled me away before I could really getting it together this past year but the email is restornow(at)mail.com, obviously the (at) section is the symbol @. Send me a note Peggy, and I will get back to you. Please anyone else who wants to stand up for real equality feel free to write me too. Real Change - It often starts with just a few people who really care. I am not leaving my faith that I love either Peggy, I was called to priesthood myself in my teens, and God needs us to fight for our religion to become just where it is not so we are church that heals not a religion that hurts people as frequently as it heals them. This world and our youth desperately need our church to act like Jesus so they can come home and feel good about doing so. Sadly, the Church moves so slowly. I was encouraged that deacon ordination of women was being studied but I have not heard much more about it. Deacon ordination of women seems like a no-brainer solution to the expansion of universal Ministry but even that seems so far off at this point in spite of parish closures. Bishops and priests don't seem interested in the wider viewpoints of the laity to open up Ministry. I know of a woman who expressed to her bishop her conviction that she felt called to Ministry. The response was this could not be a legitimate discernment from God since HE does not call women to that office. This is so obvious and logical I'm sure many people will object to it!